We are passionate about Occupational Therapy and protecting our chosen field! That's why we are working so hard to raise funds for the TOTA PAC. We have been challenged to raise $5000 by the end of conference and if we can meet our goal, we will receive $5000 more from an anonymous donor! That's when we came up with a new idea... Let's have a virtual FUN RUN! Click HERE to register for this fun event. What is a Virtual Fun Run? A virtual run is a fundraising event that can be done at any venue that you wish. You can walk, jog, run or skip the distance of your choice. You can complete your race at the gym on a treadmill, a practice run in town, a stroll in the park, or another local racing event. No proof is required for your race, but it would be awesome if you could upload pictures and tell us about your experience on our Facebook page. How was your event? Where did you run? Who did you run with? Use the hashtags #RunwiththePAC2018 so we can find and congratulate you! 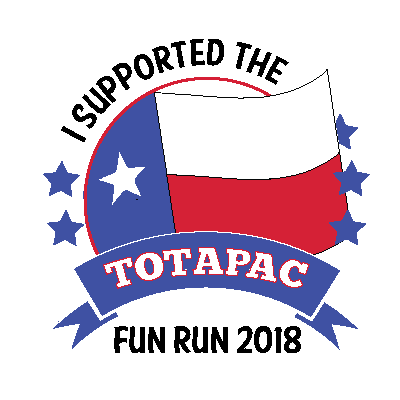 Why should I participate in the TOTA PAC FUN RUN? The short answer would be because it’s a fun way to join in with other Occupational Therapists and Students! • Complete control over your schedule. Run when you want, where you want and complete the race on your own time. • No travel expenses, no hassle with parking and no long lines waiting at the potty. • Most importantly, a fun opportunity to take raise money for our political efforts!!! TOTA PAC – FUN RUN 2018 – Post Results HERE. 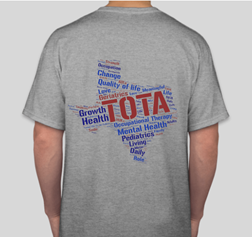 any item for which your donation amount will qualify: badge, pin, and/or TOTA T-shirt. For example, a $35 donation qualifies for the "Jogger Level" swag. A $50+ donation qualifies for the "Runner Level" swag. *Virtual badge is on confirmation page after completing the registration form. Please copy and paste it for your files.